I am looking for a flight search engine that lets one filter flights by transit/via-point besides travel destination. Like the one that's shown in the above image. I tried popular travel portals like makemytrip.com, cleartip.com, yatra.com etc but I couldn't find the facility. When the question is "which flight engine lets me filter via (unusual request)", I've found the answer to almost always be ITA Matrix. 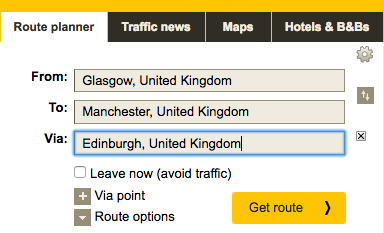 Using it, you can do searches requiring a certain transit point using their advanced routing codes. Specifically, adding X:MAN to a search would require a transfer in Manchester. I think Hipmunk used to also have a similar feature, but they unfortunately seem to have gotten rid of it. Best of luck! Not the answer you're looking for? Browse other questions tagged air-travel transit international-travel flight-search-engines or ask your own question.